There are three recent revelations that directly tie to what we have been saying. Today, the Justice Department announced that 13 Russian nationals were indicted for interfering in the 2016 election in acts of “information warfare.” There are some really serious implications here and no doubt partisans will be attempting to spin this as either pro- or anti-Trump for political reasons. The indictment makes clear, however, that the effort did not change the outcome of the election. Further, it is clear that activity was both pro-Trump and anti-Trump, suggesting the goal was discord rather than a specific outcome. In fact, the activity began prior to Donald Trump entering the race. Finally, there is nothing in the indictment that suggests any willful collusion by any American. In fact, the indictment makes clear that the Russian instigators went to great lengths to hide the fact that they were Russian. They attempted to portray themselves as American activists under the banner of the Internet Research Agency. Why is this so significant? This finding continues to demonstrate what we have shared over the past decade, mainly that Russia has been engaged in a type of warfare against the United States. That is fact. This effort is based on destabilizing our economy and unity following the playbook of Unrestricted Warfare. This first example shows a long-term Russian effort to undermine American solidarity. When you read the post, you will note that Putin dreams of a divided United States and has undertaken an economic war to achieve it. The second example clearly shows that Russia sent spies to the United States in an effort to learn how to undermine our market using Exchange Traded Products (ETFs and ETNs). Aug 24, 2015 – And, don’t forget that a Russian spy was caught trying to learn how to “destabilize ” American stock markets using ETFs. Here is an excerpt from Justice Department charges regarding the case against three Russian spies: part_2. The Russians were seeking ways to destabilize stock markets with ETFs? This post is very significant in light of the recent market turmoil and another revelation of the past week we will discuss. The bottom line here is that Russian subversion efforts are much wider than simply attempting to influence the electorate. In fact, the clear proof of Russian efforts to fund both sides of protests and rallies validates our concerns in many respects. On February 13th, the U.S. Senate Intelligence Committee held important hearings featuring the top intelligence officers in our government. The hearings are worth watching. Here is a link to see them. On February 13, U.S. Director of National Intelligence Dan Coats appeared before the Senate Intelligence Committee and discussed his just-released “Worldwide Threat Assessment of the U.S. Intelligence Community” report. That document synthesizes what U.S. military and civilian intelligence analysts, cyber warriors and counter-intelligence experts regard as the “sobering” (a word Coats used) threats to the American people and their interests. During his testimony, DNI Coats was flanked by the directors of the FBI, CIA, the Defense Intelligence Agency, NSA and the National Geospatial-Intelligence Agency (NGA). Their agencies contributed to the assessment. Coats’ initial threat statement is sharp, clear and dire, so I’ll quote it at length. Sobering? Yes. Interstate wars can escalate into regional wars. When belligerents possess WMD, escalation can have global consequences. However, on the cusp of the 21st century’s third decade, other wicked variables complicate diplomacy, spying, commerce, warfare and minute-to-minute human survival. That summarizes many wicked activities. Examples include cyber disruption of communications, cyber crime, propaganda and false flag operations, economic warfare, political and economic penetration of international institutions and support for proxy warfighters in crises in order to destabilize a region. Coats identified five “functional” types of threats to the U.S.: Cyber spying, propaganda and attacks directed by nation states, non-state actors and criminal groups; WMD and WMD delivery systems; Terrorism; Technological threats from space and in space; Transnational crime. The cyber war has begun. “Frankly the U.S. is under attack,” Coats said, by “entities” using cyber pathways to penetrate security and economic activities. Russia, China, Iran, North Korea and crime organizations conduct disruptive cyber operations against the US. China is particularly adept at using cyber weapons. All of this confirms both what we have shared with you over the past decade as well as the original research we conducted for the Pentagon and then relayed to multiple federal agencies starting in 2008. We are already in a global cyber-economic war. Our adversaries are the same ones we have described to you (including radical Islam). the weapons are as we have explained, cyber, market manipulations, economic warfare, propaganda, Intellectual Property theft, and so forth. Beyond that, we have explained in detail how China, coordinating with and perhaps led by Russia, has purposely sought to displace U.S. hegemony in the dollar and global financial system. Some see this as normal economic development. The reality, however, is far more sinister. Even Defense Contractor Raytheon now demonstrates the understanding of just how big a problem this has become. Beyond cyber, there is the massive infiltration at all levels, including our own CIA. The Chinese have even made serious efforts to turn our own companies against our interests. U.S. regulators on Thursday killed the politically sensitive sale of the Chicago Stock Exchange (CHX) to a group led by China-based investors, saying a lack of information on the would-be buyers threatened the ability to properly monitor the exchange after the deal. The move by the Securities and Exchange Commission (SEC) ends a two-year battle to gain approval for the sale and underscores the more hostile environment facing Chinese buyers under the administration of U.S. President Donald Trump. Trump brought the CHX deal up twice during the election campaign as an example of how jobs and wealth were leaving the United States. SEC staff initially approved the sale of the privately owned exchange in August, but within minutes of the announcement SEC commissioners, led by Chairman Jay Clayton, a Trump appointee, put the decision on hold for further review. U.S. lawmakers from both parties had harshly criticized the deal in joint letters to the SEC, arguing that it would give the Chinese government access to American financial markets and questioning the SEC’s ability to regulate and monitor foreign owners. “This has been a long fight, and I am grateful we now have a President who recognizes the national security threats of allowing a Chinese government-affiliated company to own the Chicago Stock Exchange,” Republican Congressman Robert Pittenger said in a statement on Thursday. Recent presidents generally ignored American first things, e.g., core American principles such as Compact Theory, Popular Sovereignty, and Subsidiarity, which underlie our Declaration of Independence, Constitution, and Bill of Rights. Instead, they focused mostly on second things, e.g., money and survival — priorities for even atheist criminal thugs and Islamist jihadists. The new “National Security Policy” then proclaims, “‘We the People’ is America’s source of strength,” followed by this veritable parade of American first things: “The United States was born of a desire for life, liberty, and the pursuit of happiness — and a conviction that unaccountable political power is tyranny. For these reasons, our Founders crafted and ratified the Constitution, establishing the republican form of government we enjoy today. Not since Ronald Reagan has an American president so courageously and publicly reaffirmed American first things. In other words, this Administration recognizes the total war we are in. The key to victory is drawing upon our national strength which is found in our spiritual, and economic fiber. The stock market just enjoyed one of its strongest weeks in years after last week’s serious decline. People have been wondering what caused the sharp loss, which seemingly arrived out of the blue. Many experts point to the purchase and sale of “volatility” derivatives used by professional managers to hedge risks. A U.S. regulator is looking into whether prices linked to the stock market’s widely watched “fear index” have been manipulated, according to people with knowledge of the matter. The Cboe Volatility Index, known as the VIX, is derived from S&P 500 options prices. The Financial Industry Regulatory Authority is scrutinizing whether traders placed bets on S&P 500 options to influence prices for VIX futures, the people said. Separately, a letter from a law firm Monday representing an unidentified client urged U.S. regulators to investigate VIX manipulation, claiming it has cost investors hundreds of millions of dollars in losses each month. If evidence of manipulation is found, it would be a black mark for the VIX, which has soared in popularity over the last decade as a hedging tool for investors. The VIX is designed to track investor anxiety and tends to move in the opposite direction of the benchmark S&P 500 index. Investors purchase VIX futures and options to protect against declines in stocks…. Some market participants and observers of derivatives markets say VIX manipulation is feasible. More than a dozen traders and brokers told the The Wall Street Journal that they avoid the expiration days for VIX futures or advise their clients to do so, with some citing manipulation fears. The amazing thing is that an estimated $8 billion in trades of volatility products (much of that in Exchange Traded Notes) could be responsible for $3 trillion in stock market losses. Considering that an enemy would only need to start the trade, the potential for manipulation is clear. In fact, a clever saboteur would find a way to profit from the turmoil. Now, couple the reality of manipulation with the fact that our markets are all controlled by machines. A clever hacker could cause a complete collapse as we have warned. So, we know that Russia and China and others are hacking things daily. And, we know that Russia and China and others have purposed to so mayhem. Can we doubt that they are working on crashing our markets? A massive amount of automated trading helped cause last week’s turmoil in the U.S. stock market. It reminded me of Skynet. Remember Skynet? “Skynet is a fictional … artificial general intelligence system that features centrally in the ‘Terminator’ [movie] franchise.Skynet gained self-awareness after it had spread into millions of computer servers all across the world; realizing the extent of its abilities, its creators tried to deactivate it. — Wikipedia …. Those worried that Skynet has conquered financial markets are urged to read “Flash Boys” by Michael Lewis, who describes the proliferation of high-frequency trading. I believe the speed of the decline over the past week was driven by computers trading with other computers on high amounts of leverage. High frequency trading (HFT) routinely surpasses 50% of volume on most stock exchanges, and it may have made up more than 50% of volume last week. Early warnings of problems HFT proliferation have been consistently given by ZeroHedge. The 1987 crash in the stock market was blamed on “portfolio insurance,” a form of computerized trading in which the lower the stock market went, the more the computer programs sold into the move lower, which created a quick avalanche effect. Some of last week’s moves felt like small avalanches…. The ETP (Exchange Traded Product) space is over $3 trillion. As that space has grown, so has the use of computerized trading that helps manage ETP securities. Much of the blame over the past week has been put on short volatility ETFs, which among other things take short positions in front-month Cboe Volatility Index futures. The explosion of stock market volatility causes those ETPs to reverse their short VIX futures positions, causing a record surge in VIX futures buy orders after-hours, when such ETPs typically square their positions. On the day the Dow Jones Industrial Average declined 1,175 points, a surge in VIX futures buy orders created a surge in S&P futures sell orders as they are inversely correlated. Because of the record buying of VIX futures, their prices rose quickly after-hours, which caused many ETPs whose portfolios are short VIX futures to suffer record 80% declines after-hours, in effect blowing up their portfolios. While most of the assets in short-volatility ETFs have already been liquidated over the past week, there are still over $3 trillion in assets in all ETPs, so I am sorry to say that Skynet is still lurking in the stock market. It looks to me like the regulators allowed a monster to grow in the face of the ETP industry and they will have a very difficult time reining it in. So, we have a cyber risk (and we know of Russian, Chinese, North Korean, Iranian, and radical Islamist efforts here) and a risk of manipulation of Exchange Traded products (which we know that Russia specifically has targeted). These can no longer be denied. So here’s the bottom line. We are at risk and under attack. But we finally have a recognition of this threat by our government with concrete action being taken (as evidenced by the denial of Chinese takeover of the Chicago Stock Exchange). We will have to be diligent. The good news, though, is that we are in a solid position to win this economic war. the National Security Strategy is very encouraging. Our nation is resilient and in a better position than any nation in the world. If we take the right steps, we will alert our adversaries and enemies to not mess with us. If they want a fight, we can and will be prepared to win. I can tell you that we are doing our part to awaken America. We’ve written two best-selling books on the subject (Secret Weapon and Game Plan). We’ve briefed our government and thought leaders. We’ve written this Blog and spoken to groups across the country. Now, we are launching Economic War Room with Kevin Freeman, a new online television program that will clearly address the economic threats we face. We will offer understanding of the threat, solutions for the problems, and a clear message of hope. 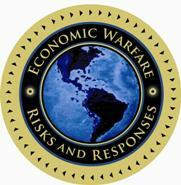 Register at EconomicWarRoom.com to be notified of our launch.